What sort of numbers are we looking at? Will stock motor handle it? Any quicker than stock turbo with tune down low, or is it mainly top end? I would love to upgrade my turbo, but as it mainly on the street I wouldn't want it slower down low. This turbo can provide more airflow than an OEM motor can handle. It is a turbo that can be tuned to well over 500whp. However it's nice to have a setup with the top end should it be needed as well as the low end response. 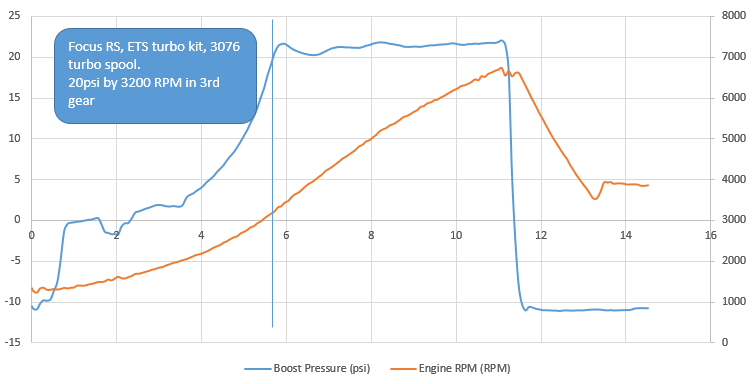 I don't mean this as an advertisement - I am just showing how a well designed setup can allow even a large turbo such as the GTX3076 to have good boost response. Hey Alex, thanks for this thread! I plan to be using it more in the future as I'm planning on ordering a tune from you shortly. I'm just trying to decide what is best for me (Flash vs. Pro). CheeRS! Impressive spool with good top end - this is a hallmark of a well sized turbo and well designed turbo kit. We got this stock motor Focus RS to spool to 20psi by 3200 RPM with the ETS turbo kit using a GTX3076 turbo. In this case you can have your cake and eat it too. Broad power band, good response and lots of top end for when this car gets built. So how does this compare to the stock turbo? Really interested in this sorta set-up but mine is a DD car so I really want to keep as much of my low end power band as possible. Essentially the protune and flash tune start at the same place. We build the tune based on our experience for the fuel and parts you have. The flash tune however has 1 datalog revision and protune has an unlimited number of revisions until we are done refining the car for that particular setup. So the protune ends up being a little more refined. The spool is a little slower than stock but just a little. The top end potential of this setup is very much superior to stock and you really notice this if you are going to build to above 400whp, aux fuel, etc. Any discount codes out there? EDIT: No worries, got my order in today! Last edited by herbnhero; 02-27-2019 at 07:41 PM. Canada and Independence Day Stratified Sale!